Yes, you heard me right. Don’t just click to connect. There is an epidemic of people out there misusing social media. Instead of using it to get to know people, build deeper relationships and help others there seems to be this random connecting that is no more effective than a great big cold call list. I constantly get connection requests from people I don’t know. They give me no explanation of who they are, how they know me, why they want to connect, or why I should connect to them. So, I don’t. Don’t get me wrong; I don’t mind connecting with people I don’t know, after all, that is what networking is about. As long as these strangers are willing to get to know me and let me get to know them, I am happy to add them to my network. But I don’t want to be connected to a bunch of strangers – what purpose does that serve? Simply put, if they don’t know me, like me and trust me, they aren’t going to introduce me to their boss, best friend or colleague. So what is the point? If you are not willing to build and maintain a relationship with me, please, don’t click to connect. Social media is a form of networking and should be done with the same care as in-person networking. When you attend an event and meet new people, you have a conversation, exchange business cards and maybe even set up a time to meet again. You spend time getting to know each other and figuring out what you have in common. It’s the same online. When you connect with someone you don’t know, you have a conversation, exchange information and maybe even set up a time to meet or talk on the phone. 1. People don’t understand how to network on social media to make meaningful connections and build relationships. 2. The social platforms don’t require good networking they suggest it, but their tools don’t make it easy. Let’s explore these one at a time. It’s hard to teach yourself how to use social media. People think you just start an account and click around. That may be fine for young people, students and others who aren’t concerned about using these platforms for work. If you intend to use social media for business you need to learn it, just like any other tool. Take a class, have someone teach you, read or watch videos on the subject. Again, it’s networking. Would you go to an event with a bag over your head and no business cards? I don’t think so. And yet, so many people are on LinkedIn, Facebook and other platforms with no photo and little or no information filled in. To truly make social media networking effective you first need to have a complete profile so people you know, recognize you and want to connect to you. For people you don’t know, they can learn how to find something in common and determine whether or not they’d like to connect. Next, make sure you are connected to people you know and then interact with them. That means click like, comment and share. You have to spend time networking online, just as you do in person. If you typically spend a few hours each week going to networking event, then spend a few hours a week networking online. What you’re trying to do is run into people online and converse. Converse – Send a private message or respond to something they posted with a question. LinkedIn and Facebook recommend you only connect with people you know. They ‘suggest’ you send a message but it’s optional. That’s the part that is wrong in my opinion. 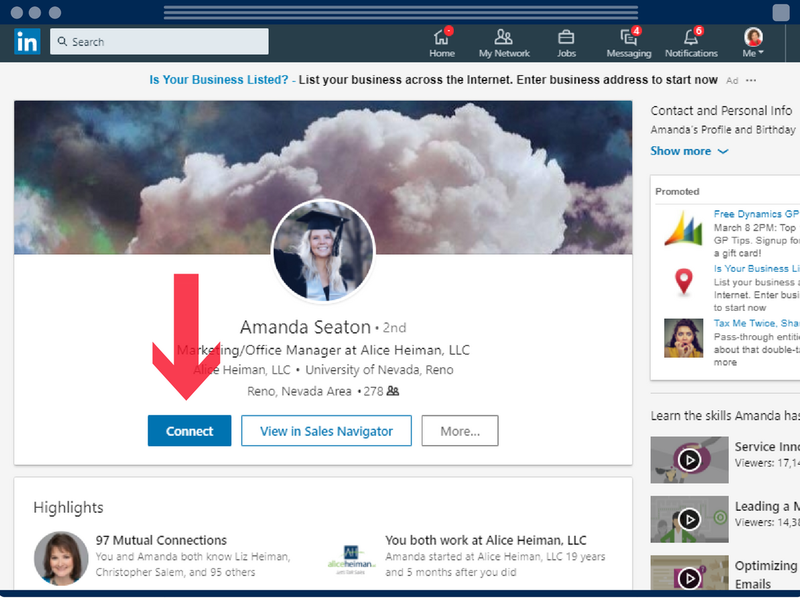 In all cases when you click the Connect or Friend button you should have to send a message that identifies how you know or don’t know the person and why you want to connect. Good business etiquette would prompt you to do that. 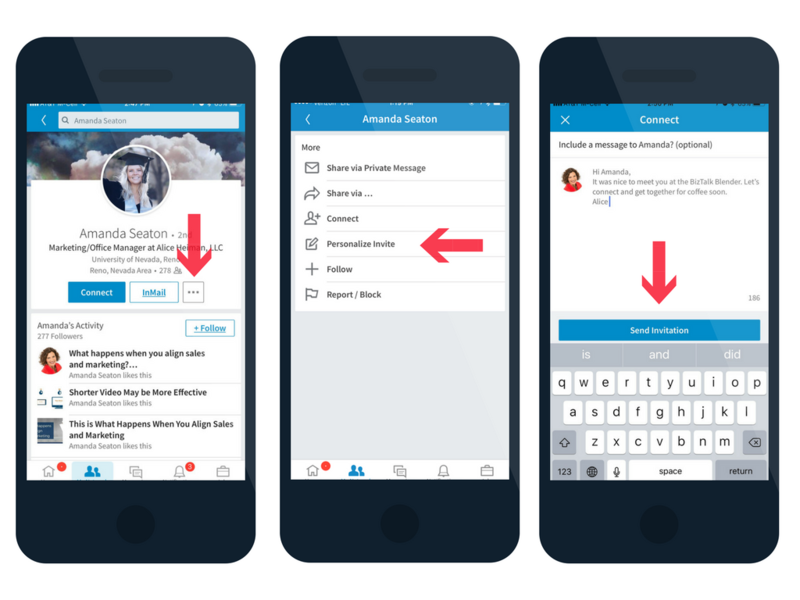 Unfortunately, Facebook removed the feature that allows a message be sent with a friend request and LinkedIn has many places where you can click connect and it shoots off the request without letting you have the opportunity to add a message. Do your best to make social media personal. And for Heaven’s sake, don’t click to connect from this page. This is so annoying! 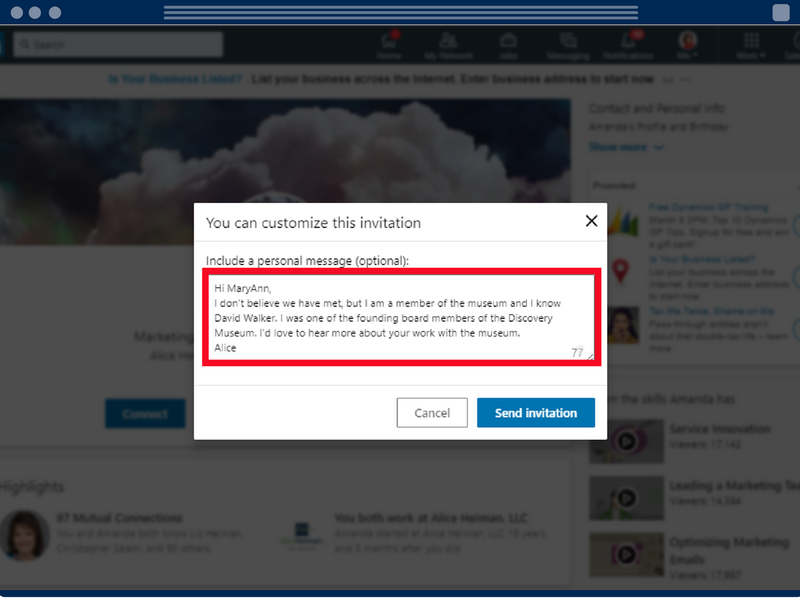 The only place on LinkedIn where you can request a connection and include a message is from a person’s profile. Once you click connect from a profile this screen appears and there is a place to click add a note. Note: It says optional. 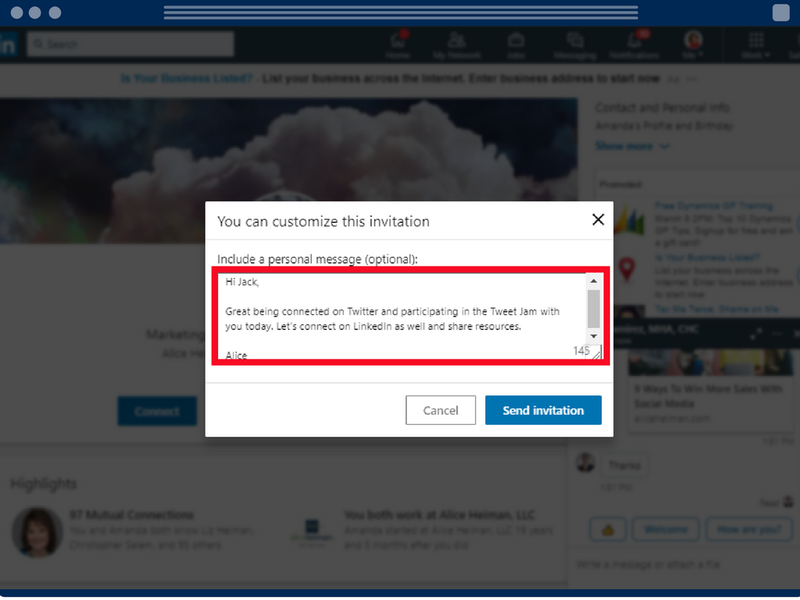 It should not be optional and it should not allow you to send the generic message, “I’d like to add you to my professional network on LinkedIn.” Of course you would, that’s why you are sending me a request. What I would like to know is who you are and what is inspiring you to connect with me. Once you click add note this screen appears and there is a place for a personal message. 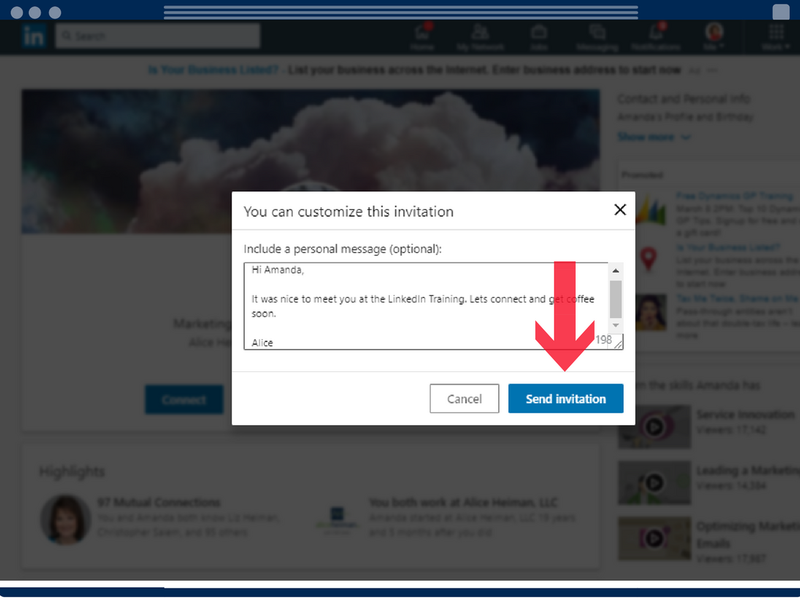 Add a message and click send invitation. Here’s an example. I don’t know Jack personally, but we are connected on Twitter and often retweet each other’s posts. We participated in an event together. You can connect to people you don’t know at all, but it’s just like real life. You have to have a valid reason or it’s AWKWARD! Be sure to let the person know what you have in common, why you are connecting and what you want from that connection. If you are connecting with them simply to send them sales messages as soon as they accept, don’t do it. If you are connecting to determine if they are a prospect, then build the relationship first, add value by sharing great content and at the point where you determine that they may have a need, you can schedule an appointment but don’t spam them with sales messages on LinkedIn. Be careful when using the LinkedIn app for tablet or smartphone. It isn’t obvious but you can send a message with your connection request . Be sure to start on the person’s profile by clicking “view profile.” Then look in the middle for three dots. 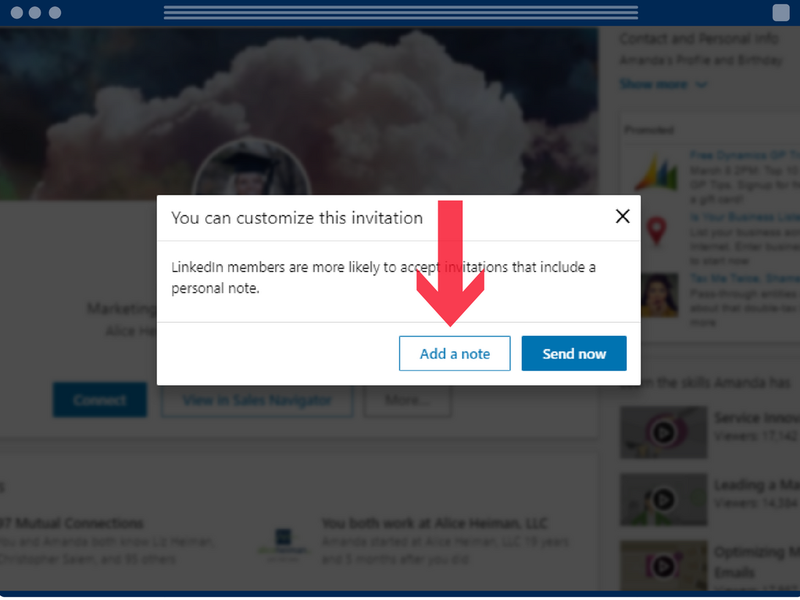 When you click the dots you will be given 6 choices and one of the is “Personalize Invite.” Click that and it allows you to write a message. The idea is to build relationships you can leverage not have hundreds of connections to people you don’t know. That means that once you have connected, you have to find things in common, converse, share and be helpful. These are the things that develop trust and get people to like you. Then they will help you, when asked. It’s easy to run into people online, in fact it takes a lot less time than it would in-person. You can have quality interactions that can lead to collaborations, referrals and yes, sales. 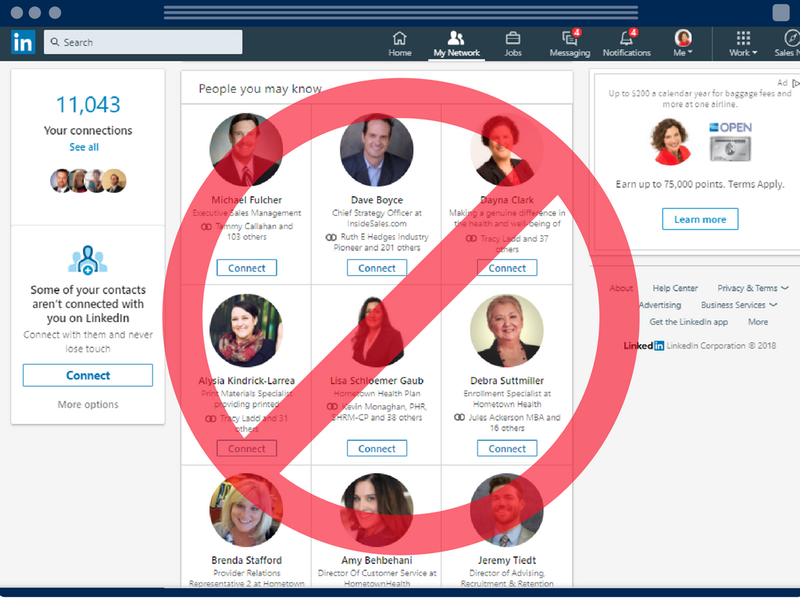 One of my favorite tools to help me network online is Nimble. It directs all of your social media to one spot and makes it very easy to meet new people, find things in common and stay in touch. There is more to it. Take the time to send a note about who you are and why the connection will be beneficial. Then spend time building the relationship by running into them online and adding value by sharing useful information and making introductions. It’s easy and efficient and it works. Need help with your LinkedIn strategy so you can generate more leads? Schedule a 30 min. strategy session now! I’ll stop immediately. Generally, I’ve avoided the click to connect but have to admit I’ve done it. I adore this article! I ignore virtually ALL connection requests without a note and this blog gives me the ammunition as to why. I particularly like the way you show how to add a note on the mobile version; great stuff!